Celebrity Apprentice returns to NBC Sunday with a whole new episode called, “Lightning Strikes Mr. Hang Brain” and we have some photos, spoilers and a juicy preview video for your enjoyment. Have you been watching this season of Donald Trump‘s hit show? We have and we are hoping that Omarosa does not avoid the boardroom this week and get fired. What do you think of Omarosa this season? Hit the comments and let us know. Official synopsis for this week’s show: “THE ALL-STARS SHOW THEIR ARTISTIC SIDE TO CREATE AND SELL ORIGINAL ARTWORK. On Sunday the celebrities are tasked with creating original, three-dimensional artwork. But winning the task comes down to fundraising, and one contestant struggles with bringing in enough money to keep the team safe in the Boardroom. Meanwhile, the other team’s Project Manager has to deal with a teammate who over-promises and under-delivers. Penn Jillette tells Plan B that although the teams are tasked with creating artwork he does not think that anyone would want to buy their art work. He tells the team they just have to get 15 doners who will give as much money as possible. Stephen Baldwin is not pleased with that approach and lets Penn know that he thinks a better plan is to contact an art dealer and pitch the fact that they are selling celeb art. Stephen believes their artwork could easily sell for $20,000 or more. Stephen then gets on the phone and speaks to, “a prince.” His team members were just not buying it and think he lying and pretending about who he is speaking too. I wonder if Stephen is the teammate who over-promises and under-delivers. Special guests this week include Chaz Dean and The Blue Man Group. 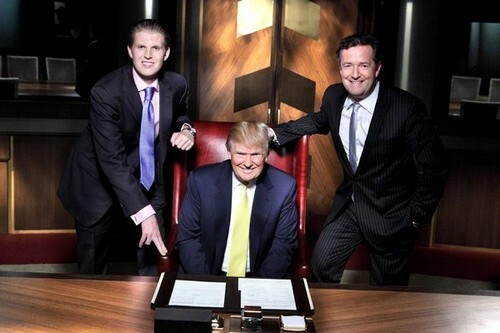 Boardroom Advisors: Piers Morgan and Eric Trump. Don’t forget to tune in this Sunday March 31st, 2013 for the new episode of the Celebrity Apprentice.